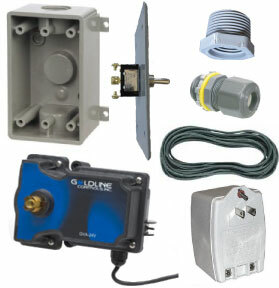 The Goldline actuator comes with a 20 ft. cable which needs to be routed into the plastic outlet box and connected to the toggle switch. If you need more cable length, order additional lengths of the Copper Wire 3- conductor. 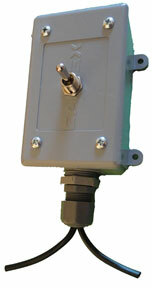 The kit includes 20 ft. of Copper Wire 3-conductor which is used to connect the transformer to the toggle switch. If you need more cable length, order additional lengths of the Copper Wire 3- conductor. Individual parts in the kit must be assembled onsite by the customer. Please download the kit document for more information.